Posts featuring the people I know best – My Family. Entrepreneurs, What Would YOU Risk? It was 30 years ago, that Summer between my Junior and Senior years of college. 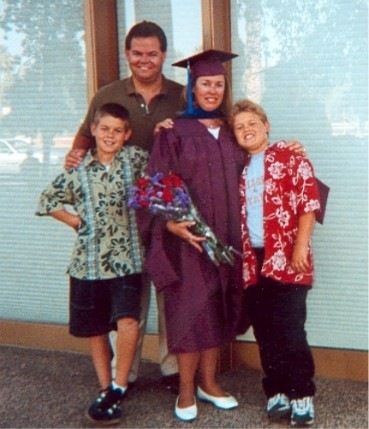 I was living with my parents in Danbury, Connecticut and had started dating the boy across the cul-de-sac. One Sunday afternoon, we went out on our boat – Me and my Dad – and that boy and his Dad. We were cruising around Candlewood Lake and anchored across from “Chicken Rock”. “So, who’s ready to risk it?” – my Dad joked. Everyone was laughing but I was game. I dove off the bow, swam to shore and started to climb. I was game – but not crazy. 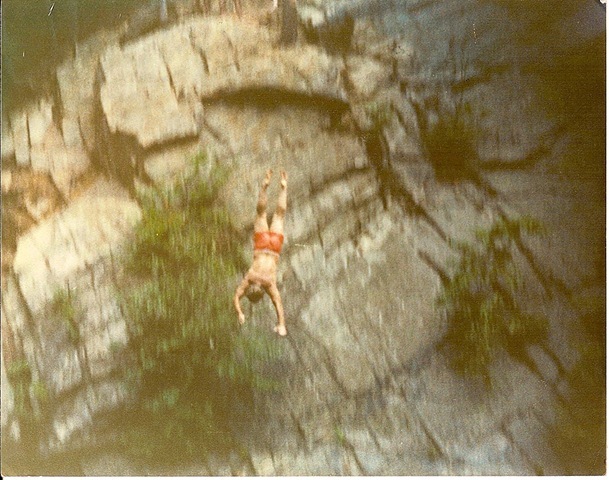 I climbed to the mid point – about 15 feet up – and jumped into the lake. As I was swimming back to the boat, my Dad started yelling and pointing at the rock. I looked back just in time to see that boy. He had climbed to the highest point – and dove in head first. Dad even caught it with his camera. Ya gotta love a guy that’s willing to risk it all. I did. Five years later, I married him. What, you may be asking, does this have to do with entrepreneurship? Well, it’s not that different. Many will tell you, at one point or another – you have to calculate the risk and take that leap. And when we do it well – we reap the reward. This morning – October 1, 2009, a reminder popped up on my calendar. 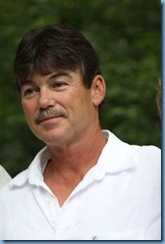 Today was the day my brother Rick retired officially from General Motors after 30 years. He started in the Newark, Delaware plant at the age of 18, the day after his birthday. Over the past three decades, he saw many changes, slow downs, strikes, and lay offs; but, he also saw innovations in manufacturing and new automotive technologies evolve. He started at GM in a time when working as a GM employee was a safe bet for the future and retires in a time when many have to wonder what comes next. But, through it all, he was a hard working and dedicated employee, who delivered value, and through his working years at GM, bought a home, raised a family, and now in his ‘retirement’ years plans to focus his energies on building another business – his own. I’m proud of him. He’s a great example of what it means to grow up in a GM Family. And I know that his own business will prosper because he brings to it a dedication to customer service and quality that will make his customers keep coming back and even more important – tell their friends about him. Also today, I saw an article pop up from AdAge with another footnote to the GM Story. This one too was another goodbye – After Talks to Sell Fall Through, GM Says Goodbye to Saturn. The story chronicles Saturn’s story through it’s ads. It’s dedication to innovation and service, the commitment it had to its customers and in many ways the feeling of engagement it’s employees, dealers and customers had in turn with Saturn. Now with the Penske deal falling through, soon Saturn will be no more. Saturn was once the shining star of General Motors, yet through years of corporate in-fighting and internal politics between the GM car divisions and the resulting challenges created for Sayurn, the fledgling brand could not grow to fulfill its promise. Now Saturn is becoming ‘GM’s orphaned child’ – with no opportunity for a new homecoming on the horizon. Saturn employees and dealers put together a valiant fight to save something they believed in – a quality product, a new way of doing business, and commitment to giving the customer what they want through partnerships as shown in this – one of the last Saturn commercials. Unfortunately, it looks like this time, they could not win the battle. Innovation – doing something in a new way to make life better for the people who matter – is a wonderful thing – unless you happen to be the one who missed the train when it pulled out from the station. That’s what happened to a once great family business, Koerber’s Beer. Hey – you may be thinking – that name sounds familiar. 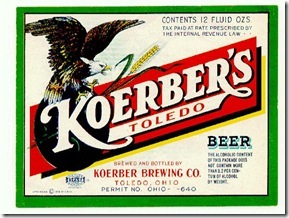 Yes, Koerber’s was once our family business run by my grandfather William G. (Bill) Koerber and his brothers. Koerber’s Beer and the other brands, including Friar’s Ale and later a new innovation, Malt Liquor led the brand portfolio. Grandpa’s brother, Clarence “Click” Koerber, invented malt liquor and began production at the Grand Valley Brewing Company in Ionia, Michigan some time around 1937. Great Uncle Click named his magic brew Clix Malt Liquor. The family business managed to survive through two World Wars, Prohibition, and the Great Depression. Instead, it was an innovation in the brew master’s art that led to it’s demise. That change was the practice of increasing the preservative content in beer and ale. By adding additional preservatives, competing breweries were able to ship their beers for greater distances, store the product for longer periods of time, and increase shelf life for distributors and retailers taking advantage of major economies of scale. There was only one problem, it affected the taste of the beer. 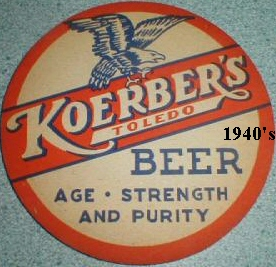 Koerber’s brand was associated with Age, Strength, and Purity. Grandpa, as brew master was sure that no one would buy let alone want to drink the lesser product. And Grandpa was wrong! 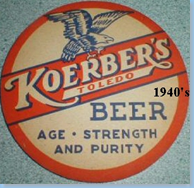 By 1949, the last bottle of Koerber’s beer was crated and shipped from the plant in Toledo, Ohio. The factory was closed. What today we would call a series of micro breweries, Koerber’s, and it’s sister company Grand Valley Brewing could not compete with the mega brewers who had emerged. By the time I came along, in 1960, the only Koerber’s beer that was still in production came from the mini brewery that was hidden behind the secret wall in the Dutch Room off the boat well in Grandpa’s home at Grayhaven on the Detroit River. But that’s a story for another day. So when you hear the whistle blow and see the innovation train pull into the station, be sure to have your ticket ready so you can board. You don’t want to be left behind! How big of an impact can one thing make? Grandma looked at life as a series of chapters, each full of choices, opportunities, goals and challenges. When one chapter ended, another commenced. You might not have control of all the twists and turns of the plot, but you could make a huge impact on how the story turned out. So, why write an article about business – and that’s what this is – with old proverbs and messages learned at Grandma’s knee? Because we often make business and business decisions much more complicated than they need to be! You’ll never finish if you don’t get started. Our lives and our businesses are made of a continuous series of little things – some that may seem important at the time but have little impact in the grand scheme and others that seem insignificant but can have a long and lasting affect. The trouble is that we lack perfect intuition or the crystal ball to determine what the important things are right now. There may be some pretty big questions that you are be facing in your life or business in today’s economy. 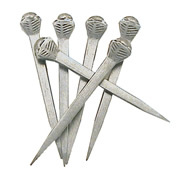 It pays to keep in mind that the simplest answers are often the right ones and, as in the case of the nail, one small thing can make a big difference. 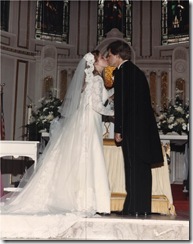 I married Chris Walker on June 8, 1985. Now for some that may seem like a long time ago, but to me it feels like yesterday. There were some that probably wondered about us. We’re very different people in some ways. But where it really counts, we’re a lot alike. We share the same values, the same love for family, and most of all, over the years we’ve learned to work together to build something we both believe in, a great family of our own. We both came from families of five kids and were blessed with great parents. 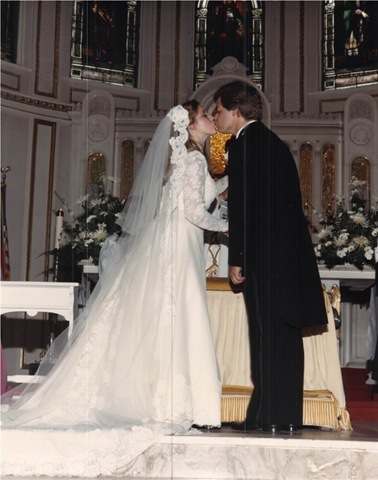 If you think 24 years is impressive, both my parent’s and Chris’ will celebrate their 50th wedding anniversary this year in August! I was talking to some friends over the weekend about marriages. Together, we’ve raised two great kids and built built a life where we can pursue very different interests while celebrating each other’s successes. Most importantly of all – at the end of the day, we have someone we love to share it all with. I’ve heard it said that hindsight is 20/20. Well looking back, I have to say, for me, picking Chris Walker to be my partner was a great decision. Wouldn’t you?